(KIVALINA, Alaska) – Barges delivering equipment, fuel, and supplies arrived in the coastal community of Kivalina, Alaska last month, kicking off construction of the Kivalina Evacuation and School Site Access Road project. 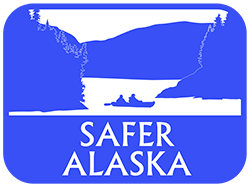 The Alaska Department of Transportation and Public Facilities (DOT&PF) used an innovative team approach to deliver this project, located in DOT&PF’s Northern Region. “Upon this moment lies the future well-being of our people,” said Stanley Hawley, Tribal Administrator for the Native Village of Kivalina, underscoring the urgency and deep need for this project in the face of increased erosion and sea storm intensity. The project will increase community resilience by constructing a safe, reliable, all-season evacuation road between the community of Kivalina and Kisimigiuqtuq Hill that residents will be able to use in the event of a catastrophic storm or ocean surge. The seven-mile-long road will be constructed with local material, and is estimated to cost $2.5 million per mile. In addition, a 3,200-foot lagoon crossing that will connect the barrier island community to the mainland will also be constructed at an estimated cost of $25 million. As part of the innovative teaming process, DOT&PF, the Federal Highway Administration, the Northwest Arctic Borough, the Native Village of Kivalina, the City of Kivalina, NANA Regional Corporation, and other permitting and stakeholder agencies delivered the project into the construction phase in less than 22 months. Each member of the team contributed significant resources to bring the project to construction.